Working with the Environmental Art Department of the Schuylkill Center has piqued my interest in a few things. While I recognize my own conservation habits, I can’t help but wonder about my colleagues and other Millennials (those aged 18-29). Those outside of the environmental science or nonprofit sphere; how do they view the environment and its pressing issues? Surprisingly, the Journal of Personality and Social Psychology published a study earlier this year finding that Millennials were more civically and politically disengaged and less concerned about helping the larger community than GenX and Baby Boomers were at the same ages. Millennials are now the largest group of Americans outnumbering Baby Boomers (nearly 90 million strong) by an estimated 20 million. Their presence can no longer be overlooked. It’s estimated that they will have the most buying power by 2017 and for the next 40 years after that. Not only do nonprofits have to make their missions and projects more engaging to Millennials, but they also need to get them excited about social change. That’s just it. How exactly do you encourage Millennials to care more about the environment? Beyond growing their own gardens, composting, recycling, and using sustainable materials. Participant Media just launched a new channel YouTube channel, TakePart TV. The channel “serves as a digital home for clever, eye-opening and optimistic content around big issues that face our planet for Millennials ranging from teens to thirtysomethings”. Clips like the Waterpocalypse Now video, from the Brain Food Daily series takes a humorous, more crass approach, but one has to wonder if these types of media really move audiences to action. Ecoarttech, a unique organization “combining primitive with emergent technologies, to investigate the overlapping terrain between ‘nature’, built environments, mobility, and electronic spaces” may be on to something. Their current project Indeterminate Hikes+ is a mobile media app that “transforms everyday landscapes into sites of bio-cultural diversity and wild happenings”. 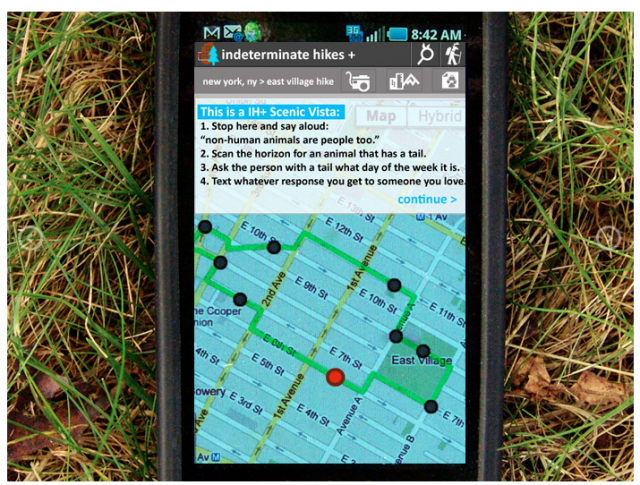 Users map out a hike in a natural or urban setting and along the way are asked to perform small tasks, learning to appreciate the surrounding environment and notice the unique sits often overlooked. Having the unique advantage of combining both visual art with environmental education, what can the Schuylkill Center take away from these two examples in order to engage Philadelphia young professionals about relevant environmental issues, such as stormwater run-off? I’m on a self-made mission to find out. Stay tuned for more blog posts from the Advisory Board, and more on the Millennial view on Environmental Art.